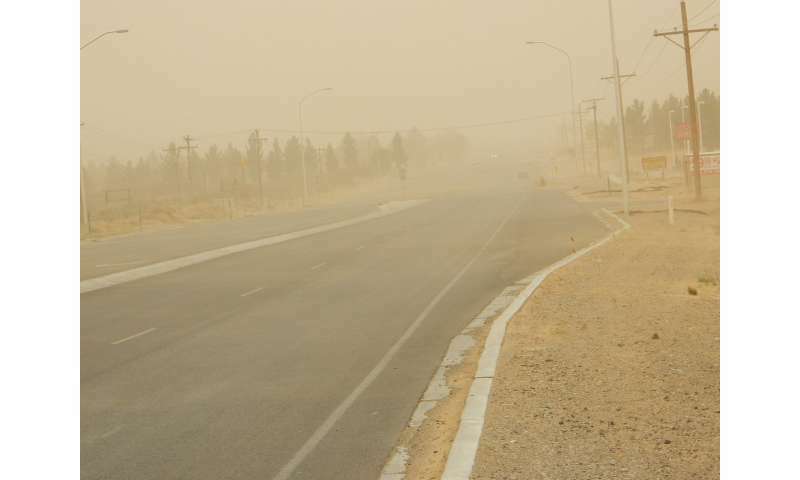 A cloud of dust rolls into El Paso, Texas on March 3rd, 2012. Credit: Joel Gilbert. 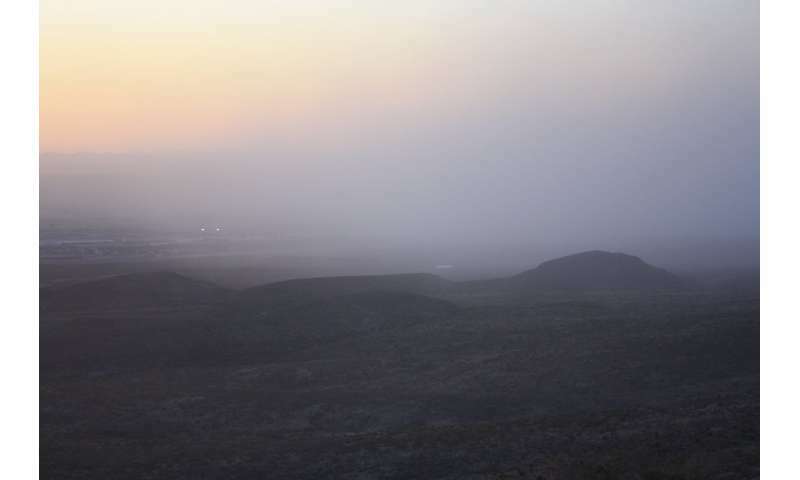 A collaboration between professors from The University of Texas at El Paso and the University of North Texas is leading to a better understanding of the composition of dust carried by rain across the state, and how that dust can affect the places where it ends up. An article published July 6, 2018, in the Journal of Geophysical Research: Atmospheres, a publication of the American Geophysical Union, details for the first time how dust—and the compounds it contains—are dispersed throughout the state in rainwater. The article, titled "Wet Dust Deposition across Texas during the 2012 Drought: An Overlooked Pathway for Elemental Flux to Ecosystems," was supported by grants from the National Science Foundation by Thomas E. Gill, Ph.D., UTEP professor in the Department of Geological Sciences and Environmental Science and Engineering Program, and Alexandra Ponette-González, Ph.D., associate professor in UNT's Department of Geography and the Environment. "The main motivation of the study was to find out how much material, and the composition of that material, is falling out with the rain," Gill said. "Dust can contain chemical elements that are actually nutrients such as iron and phosphorus. But we also know that dust can carry along with it other elements that are potentially harmful pollutants, that are very detrimental to ecosystems. We wanted to take a look at it." Dust storm on March 3, 2012 in the El Paso, Texas area. Credit: Joseph Rogash, National Weather Service. Gill and Ponette-González worked with the National Atmospheric Deposition Program to review rainwater collection samples collected throughout 2012. The year represented the tail-end of a severe drought experienced throughout the state. The dry conditions yielded a large amount of dust in the samples analyzed. Gill and Ponette-González studied dusty rainwater samples from the arid West Texas desert and the Gulf Coast near Houston. The stark contrast in geographic locations offered a clearer picture of not only the compounds contained within dust carried by rain, but the great potential for that dust to travel. Gill pointed out that some samples collected along the Gulf Coast contained dust that originated in the Chihuahuan Desert. Furthermore, Gill said, samples from the Guadalupe Mountains east of El Paso yielded disproportionately high amounts of calcium, phosphate and potassium that were deposited throughout the course of a year through only a handful of rain events. In the Gulf Coast, meanwhile, dusty rain events delivered 20 percent of the phosphate input in that area, Gill said. He added that the study marks the first time that the composition, frequency and amount of dust in rain have been quantified for Texas. "Dusty rain events are not just something that make you need a car wash," Gill said. "It's also moving stuff around in the ecosystem that could be important. We think this study points out that we have to be more aware of the potential for pollutants, but also nutrients being delivered with dust mixed with rain."